What Are Flame Retardants? How Do Huber’s Flame Retardants Work? To understand what flame retardants are, you must understand how flame retardants work. Huber uses alumina trihydrate and magnesium hydroxide to manufacture its high-performing non-halogen flame retardants and smoke suppressants. When exposed to heat, these metal hydroxides decompose to form water molecules in an endothermic reaction. This results in reduced flame spread and smoke generation. At approximately 428°F (220°C), the three water molecules are released. 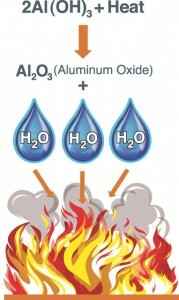 The water molecules then dowse the surface of the surrounding material, serving as an effective flame retardant. MDH acts similarly, however, it dehydrates at 626°F (330°C). In addition to alumina trihydrate and magnesium hydroxide, Huber’s has a comprehensive portfolio of molybdate complexes. Kemgard® flame retardants and smoke suppressants chemically influence the formation of organic char, effectively insulating the polymer from the heat and oxygen source thereby lowering heat and smoke release. Kemgard grades are manufactured by patented processes in which molybdates are precipitated on an inert core. The “coated core” approach makes more efficient use of the molybdate species by maximizing the active surface area, and at a much lower cost than pure molybdate chemicals, such as ammonium octamolybdate (AOM). Huber Engineered Materials is currently preparing for two key trade shows: SupplySide West and the International Wire & Connectivity Symposium (IWCS). 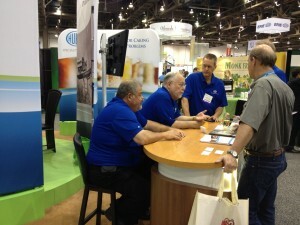 We are looking forward to meeting you soon at SupplySide West and IWCS. Please stop by and say hello and learn more about our high-performing products backed by the best technical support and customer care in the business.